story by Lauren MandelRooftops are becoming prime locations for Philadelphians to fulfill their tomato-growing obsessions. While prominent rooftop gardens in Center City and Manayunk are already raising crops in containers and buckets, the local organization Philadelphia Rooftop Farm (PRooF) is trying another very promising approach. 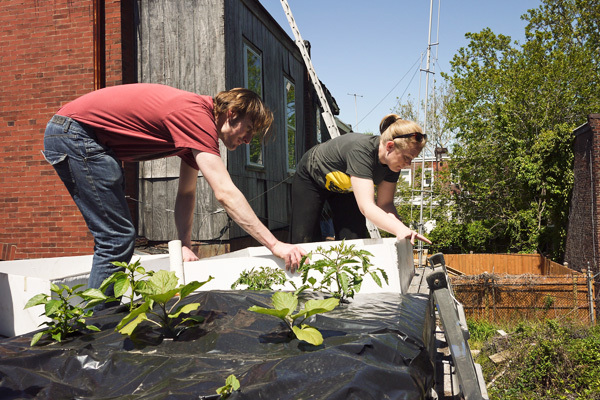 In April, after two years of planning, PRooF launched their rooftop planter pilot project on the 51st Street rowhome roof of a volunteer member. The prototype, developed with the Community Design Collaborative, conforms to the rooftop dimensions and weight restrictions of a typical West Philadelphia rowhome, which have roofs generally not strong enough to sustain heavy loads. In this project, the long, narrow planter is suspended across the sturdy knee-high walls (called party walls) between each row home to offset the weight restrictions. For the pilot project, PRooF volunteers installed plastic liners, drainage panels and separation fabric into a wooden planter frame. They then mixed lightweight soil and covered it with black plastic, which will help retain heat and reduce water loss. Eggplant, cucumber, lettuce, chard, herb and marigold seedlings were planted through slits in the plastic. So far, the plants have grown successfully and are exceeding expectations, says Sand. PRooF’s plans for rooftop greening don’t end with this first installation. The group will evaluate the performance of the West Philadelphia pilot project, make adjustments and then plans to build more planters around the city. If you’re interested in a rooftop planter of your own, visit PRooF’s website (philadelphiarooftopfarm.wordpress.com) for more information.